Specially formulated for design to accept the heavy coverage of felt tip markers without bleeding. * Colors will flow smoothly and hold sharp edges. * White sheets with fine surface texture have very good translucency excellent transparency and accurate color. * Ideal felt marker layout tracing and visualizing paper. * Excellent with markers very good with pencils. 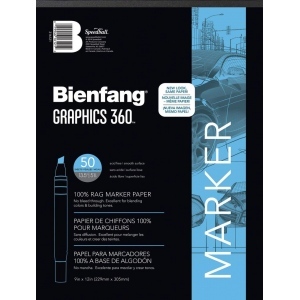 * Perfect for comps and renderings especially with solvent-based markers.